I really enjoyed this when I read it, but I had to wait for it to get round the rest of the book club before I could review it and now I find that I didn't remember much of it at all. I admit I had to wait for the other book club members to remind me what had happened before I could write this review! I do remember that I found the characters frustrating. Korede has serious issues with her sister Ayoola, she has a lot of jealousy and paints her sister as a beautiful woman who has everyone wrapped around her little finger, getting everything she wants. Korede herself is, in her own words, plain and awkward and lost in her Ayoola's shadow. As the story progresses Ayoola steals the heart of the man that Korede is in love with. Korede fears for his life but can't do anything to help him without causing harm or jail time to her sister. None of the characters are very likeable but their back story is revealed slowly throughout the book and that gives insight into why they are the way they are. I don't actually mind characters being unpleasant and these two certainly have reason to be the way that they are. It starts out as a dark story and parts of it are a little disturbing but it doesn't really stay that way. It could have been much darker and pushed the story more to an extreme. I didn't find that there was much in the way of humour in it either. It's well written (especially for a debut) and very readable, I just wanted a bit more from the story. An enjoyable, dark and a little disturbing short read, well written, but ultimately not very memorable - if I'm being honest I can't actually remember the ending. 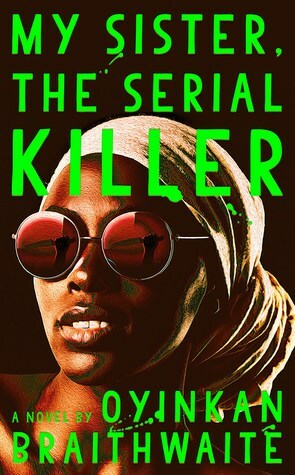 Sign into Goodreads to see if any of your friends have read My Sister, the Serial Killer.